SAN JOSÉ, CA – Written by SIR ANDREW LLOYD WEBBER “THE PHANTOM of THE OPERA”, which opened in l966 at Her Majesty’s Theatre in London, is still considered the “Reigning Champion” in New York City for being the longest running musical on Broadway. This month, the Touring PHANTOM, which opened the the 2016-2017 Season of Broadway S.J. a Nederlander Presentation, makes possible for us to see, for alimited time, theCAMERON’s MACKINTOSH’s spectacular new production. The show opened in San Jose, on September 15th with a sold-our performance. The audience was nervous. But on its opening night, PHANTOM Directed by LAURENCE CONNOR, With Book by RICHARD STILGOE & ANDREW LLOYD WEBER, (Based on the novel “Le Fantome de L’Opera” by GASTON LEROUX), fulfilled the audience expectations. The new production is a little different that the original one. The old lyrics by WEBBER and RICHARD STILGOE are not changed, and are still moving, The additional Lyrics by CHARLES HART, are appropriate and serve the purpose to clarify the story and give tri-dimension to the character of Phantom. The new sets (specially the stairwell to the catacombs under the Opera House in Paris where Phantom lives) by PAUL BROWN, are impressive and the Tony Award® winning costumes by MARIA BJÖRNSON, are marvelous. 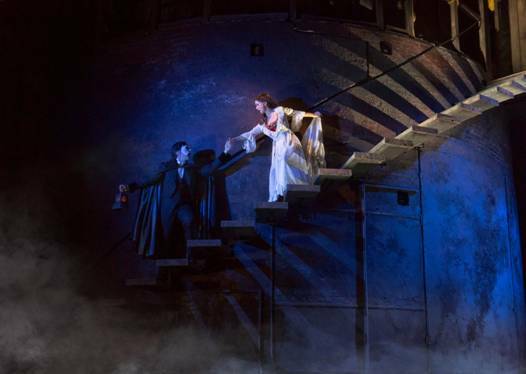 PHANTOM, the musical, is a gift to our ears and to our eyes. The new version, starts like the original version started. On the stage at the Opera House in Paris with a male auctioneer, (MARK EMERSON) auctioning the old “Props” that were used in the production of the Opera HANNIBAL, a few years ago. Among the “Props” auctioned, we see three: Lot #664, an old poster announcing the Opera. Lot #665, a Music box that plays the song “masquerade.” A wooden box with a mechanical monkey sitting on its top, that by opening and closing his arms, bangs the cymbals he is holding on his hands. The box is purchased by a man who remembers Christine Daaé (A ballet dancer and Opera singer. Lot #666 the elaborate Crystal candelabrum, than on the original version was seen crumpled on the stage floor, but in this version hangs from the theatre’s ceiling showing pyrotechnics and flashing lights when the number 666 is mentioned by the auctioneer. This candelabrum was hanging from the ceiling of the Paris Opera, on the night the production of HANNIBAL was presented and the show interrupted by Phantom. The musical backtracks, to scenes leading to that night, and we, the audience, find ourselves watching the dress-rehearsal, of HANNIBAL, on an elaborate stage, which includes a large procession of slaves, a life-size elephant, and the golden chariot of Hannibal. The production has an elaborate set representing the Middle East. A ballet, a parade, and a part of an aria from the Opera HANNIBAL sung masterfully by Tenor Uvaldo Piangi (PHUMZILE SOJOLA) in a deep sonorous voice, and soprano Carlotta Giudicelli (JACQUELYNNE FONTAINE) in a clear soprano tone. Their singing is interrupted by the announcement that the Opera theatre has been sold, and Phantom request that "his seat" in the auditorium should be kept unsold, and his salary raised. Nobody has actually seen Phantom, but they know that he “lives” in the Opera's theatre and that he gives orders to the people, by writing notes. Who is Phantom? According to Madame Giry (ANNE KANENGEISER) The Opera’s Ballet instructor, who is the only one who knows who he is and tells it to RAOUL Vicomte de CHAGNY (STORM LINEBERGER), Phantom is a man, a musical genius and inventor, but a freak of nature. For a reason no one knows, the man was born with a deformed face. He lived in Paris,for a while, but at the end, tired of being ridiculed by the people around him he decided to go away and hide from all the people, at a place where nobody could find him. Christine Daaé, is a young girl, an orphan and a ballet dancer at the Paris Opera. Before her father died, he had told her that he was going to send her an “Angel of Music” to protect her. Years later, when Phantom, who she has never seen, began talking to her, and she hears him in her head, she believed that the “voice” belonged to “The Angel of Music” that her father had promised to send her. She allows Phantom to teach her to sing. The artists and workers at the Opera, see Phantom as evil. They are afraid of him, specially when he is crossed, because they know that when Phantom’s wishes are not complied, Phantom kills. 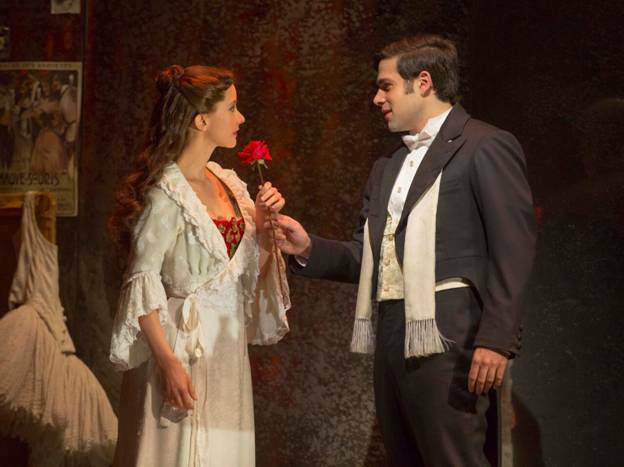 Photo of KAITLYN DAVIS as Christine and STORM LINEBERGER as Raoul. In the role of Christine, DAVIS gave the audience a realistic performance on that night. Her duet with RAOUL: All I ask of You was beautiful and her prayer in front of her fathers’s tomb Wishing you Were Somehow Here Again. sang with a lot of feeling. While her tone sounded as pure as crystal, her enunciation needed improvement. Some of her lyrics could not be understood. All the singers sang well on that night, but the best in tone production and perfect diction was RAOUL’S (LINEBERGER) His tone was full, his characterization of the character, true to life, and his vocalization perfect. In the role of Phantom, CHRIS MANN made the audience share his tragedy with the mastery of his acting, and with the feeling that he put in the interpretation of each one of his songs: In The Phantom of the Opera he show us his confusion as he rides with Christine in a Gondola through the Labyrinth underground. In The Music of the Night, he shows his tenderness, and he really demonstrates his deep frustration at the end, singing The Point of No Return. A few people did not like the new scene where Piangi (SOJOLA) a Black tenor playing the role of Hannibal in the Paris Opera kneels on the stage, raises his arms and shows his hands in chains. Many disliked Phantom showing his deformed face for a while in this version. To some it was “distasteful” to others unnecessary. A few thought that Christine, ripping the music of “her Angel in Music” was “out of character.” for her. (too cruel). And all those interviewed wished that in this version, the candelabrum, had flown over our heads, came down and clashed on the stage as it did in the previous one.. The incident, gave “the Magic” to the old Phantom. THE PHANTOM OF THE OPERA will continue playing at the San Jose Center for the Performing Arts until October 2nd. Tickets could be ordered at TICKETMASTER.COM or charge by phone at 800-982-ARTS.